What is it? – Little Wheel is an incredibly charming adventure game where you play a small robot attempting save the other inhabitants of a robotic city by restoring power to the city’s main generator. Who made it? – The game was created by OneClickDog.com. How does it play? 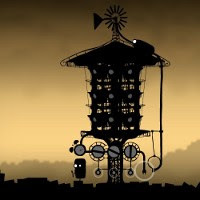 – In gameplay typical to the point-and-click adventure genre, you’ll guide the metallic protagonist across the surreal cityscape by solving various environment-based puzzles. Interactive “hot-spots” are highlighted visually, and most of the puzzles are solved simply by figuring out in which order they need to be activated. Presentation – The game opens with a great introductory cinematic, which does a terrific job of defining the look and feel of a strange and surreal robotic city, which permeates the entire game. The environments look fittingly intricate and mechanical, and some adept use of depth-of-field blurring effects and appropriate sound effects add positively to the proceedings without being distracting. All of the animation (from the main character, to the machines, to the environmental ambiance) is superb. The music is a quite impressive jazz-lounge offering, and is a surprisingly good and effective choice. All of the presentational aspects come together flawlessly. If Pixar were to make a Flash game, I imagine it’d be something like this. Positives – Little Wheel is a supremely entertaining experience, with quality dripping from every corner. The gameplay is highly accessible and focused, and you won’t find yourself wasting any time pixel-hunting for the one interactive area you missed. The story is engaging, the main character is compelling, and the artistic sensibilities at work are stunning. Negatives – The game is very easy, almost to a fault. While the puzzles are conceptually clever, they probably won’t offer much of a challenge to somewhat-experienced adventure gamers. Interactive areas are always highlighted, and though this is better than pixel-hunting, the puzzles themselves aren’t typically very intricate. Most folks should get through the game in around 10 minutes or less. The ease of the puzzles ends up making the game feel shorter than many other adventures. Why you should play it – Little Wheel is a great ride from beginning to end. Though the game isn’t difficult, it’s still a very cool and fun adventure with an engaging story. You’ll almost certainly have a good time, even though you’ll probably be left wanting more.